Detailed guide on the Lovers Arcana confidant. The Lovers Arcana is represented by Ann Tamaki. She is first seen as Kamoshida's fling. However, this all changes when she earns Carmen. This is a Persona 5 confidant guide for the Lovers Arcana. Ann Takamaki is a student in Shujin Academy. When the protagonist first meets her, Ann is meek and often isolated from many of her peers. Because of Kamoshida’s rumors, she withdrew to herself with only one friend: Shiho. However, it’s clear that she cares deeply for her friend and that she’s willing to do all sorts of things. Some of these things involve letting Kamoshida take advantage of her and other things in order to protect her friend. 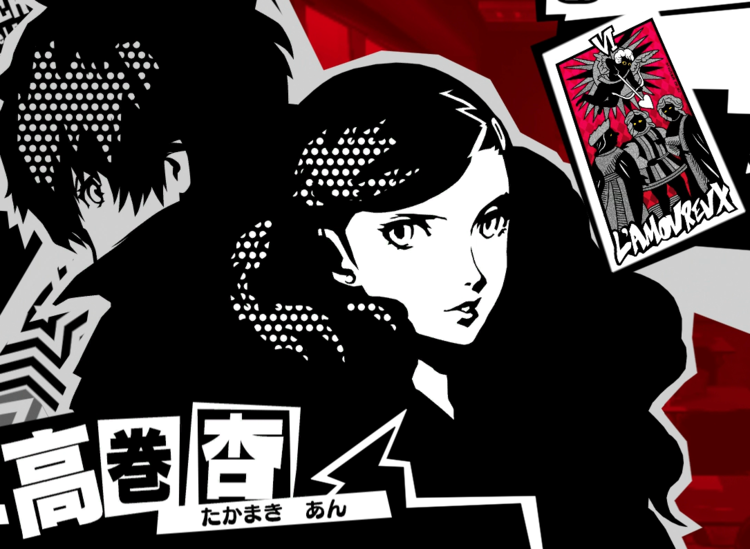 After infiltrating Kamoshida’s palace on 4/15, she awakens to her persona – Carmen. There, you also establish the Lovers Arcana. When you’re done with that, the protagonist can hang out with Ann Takamaki after school. 1 Baton Pass When “One More!” is triggered, you can pass the action to Ann. In doing so, her attack increases. If there are other characters with Baton Pass, she can also pass it onto them to stack the attack. 2 Girls Talk When negotiations fail, you have a chance of trying again. 3 Final Blow If the protagonist’s attack doesn’t down the enemy, Ann can follow up with an additional attack. 5 Fake Tears The demands of demons will lower and negotiations can be tried again. 6 Paper Fan Recovery Ann can clear off conditions from your teammates occassionally. 7 Bewitching Art During negotiations, Ann will help you persuade the target. 8 Moxie Ann has a chance of enduring an otherwise fatal attack with 1 HP remaining. 9 Covering Ann has a chance of blocking the protagonist from an otherwise fatal attack. 10 Super Awakening When maxed out, Ann realizes her resolve and Carmen evolves. Formerly Carmen, her persona evolves into Hecate. 10 All choices here are irrelevant since you have already reached the MAX rank. It’s best to take portion in a contest for among the very best blogs on the internet. I will advise this web page! It’s actually a nice and useful piece of info. I’m glad that you just shared this helpful info with us. Please keep us up to date like this. Thank you for sharing. Hi, I just fixed it now ???? Thanks for letting us know! ???? For the 2nd rank of her arc I only got +2 points when I said “she’s so strong” and 2 points in the 3rd set of questions.